The Petri Color 35 is a compact scale-focused leaf-shuttered 35mm camera that was introduced in 1968. It's a very high-quality camera that was also affordable, and it apparently sold like hot-cakes. These cameras are pretty common, so buy it for its use-value not the collector-value. Using the text or images on this website without permission on an ebay auction or any other site is a violation of federal law. The lens is a 40mm f/2.8. I've been pleasantly surprised with the quality of the Petri optics, they are quite good. What's strange about my camera is that I've noticed every other Petri 35 on the web (as well as Baird's book) has a C.C. Petri lens - meaning its color corrected. My lens does not have the C.C. mark. It may be an early unit, but I doubt it means it's more collectible. Previous Petri models (Petri 35MX; 2.8 CCS; 7s) were all rangefinders, so I was surprised that the Color 35 was scale focus. What is nice about the camera is that the viewfinder shows the scale focus distance in meters, feet, as well as icons (head-n-shoulders, people, mountains). There's also a nice projected framelines and a large + sign in the middle to help center the picture and orient horizontal and vertical lines. This viewfinder is gorgeous but without a rangefinder, it's kind of odd. Using the text or images on this website without permission on an ebay auction or any other site is a violation of federal law. The match-needle system was called the "Circle-Eye System." Because the selenium cells circle the lens, they automatically compensate for any filters. 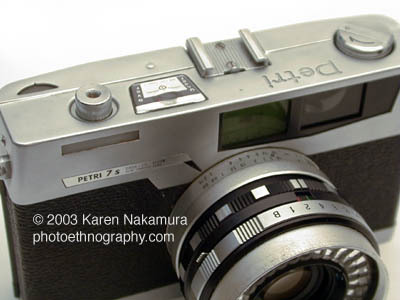 The needle is only visible in the viewfinder unlike the Petri 7s where it is also visible on top. The battery test is activated by putting the shutter to 'B' and the aperture to '22' (both marked in red) and pushing in the battery-test button on the far right. If the meter needle deflects above or onto the red bullseye, the battery is still good. If it's below, then you should replace the battery. Unfortunately, the mercury PX675 1.3V is not produced anymore, but you can use a silver-oxide SR44 instead without problems. You may have to compensate your ASA dial a bit. The Petri Color 35 doesn't have the Kuribayashi name visible anywhere because the Kuribayashi Camera Company changed their name to the Petri Camera Company in 1962. This is quite sad as I was fond of the company name (see below). The Color 35 has the nicest pop-up rewind lever that I have ever seen on a rangefinder. It's even cuter than the Canon P's. The frame counter is visible immediately below the flash shoe (which is indeed missing a screw). The focusing knob is visible to the immediate right of the viewfinder. The Petri Color 35E is two models after the Color 35 (there was a 35D). It featured a much simplified lens and metering. The 35E uses considerably more plastic in the lens barrel. The 35E also features aperture-priority automatic exposure. Using the text or images on this website without permission on an ebay auction or any other site is a violation of federal law. In the late 1960s and 1970s, there was an "arms race" to see who could make the most compact 35mm full-frame camera (and there was a similar boom in half-frame cameras like the Olympus Pen F series). The three champions in my mind were the Petri Color 35 series (1968), the Rollei 35 series (1966), the Minox 35 series (1970s), and the Olympus XA series (1979). As you can see from the photos below, all were approximately the same size, minus a few millimeters and weighed about the same (the Olympus XA with its polycarbonate frame is the lightest). A Leica CL (1973) is a giant compared to these cameras. Using the text or images on this website without permission on an ebay auction or any other site is a violation of federal law. The Petri, Rollei, and Olympus all had metering. The Petri Color 35 had a CdS cell in the lens mount, with coupled match-needle manual metering in the view finder. Very nice. The Rollei 35 series had CdS cells or selenium cells, with match-needle metering. The Olympus XA had aperture-priority automatic-exposure with a fully electronic shutter. Of course it had the advantage of being 10 years younger than the others. Only the Olympus XA managed the feat of having a coupled-rangefinder. The baselength was very short and the optics were complex, which raised the price. Olympus ended up dropping the coupled-rangefinder when it released the less expensive Olympus XA2. All three had different approaches to the question of how to make the lens compact enough to be pocketable. The Petri had a retractable, helical focus lens. The Rollei had a push-pull retractable head. And the Olympus XA used a telephoto design to make it fit within the shell without retracting. The Minox 35 which I no longer own and can't depict, has a retractable lens built into the door frame. Very nice. While the Rollei looks and feels more "professional", the Petri is an easier camera to use because of its stellar viewfinder with built-in scale-focusing display and match-needle metering. "fully coated and color corrected"
Around the lens (ATL) CdS manual metering cell. Match-needle meter visible in viewfinder. Around the lens (ATL) CdS metering cell. Automatic exposure only. Last modified: Thursday, 11-Mar-2010 01:05:06 EST , [an error occurred while processing this directive] .